Jaime Anguiano is a proud father of three beautiful children, and husband to San Juanita (Alanis), who he met when he was an undergraduate student at Dominican University. It was Jamie’s wife, born and raised in Melrose Park, who introduced him to our Village and he has loved living here ever since. Jaime and his wife are devoted parents who enjoy spending quality time with their children, not only providing fun activities but also instilling in them moral values so they can live a healthy and productive life. On any given day you may see the Anguiano family at the park playing catch, kicking a soccer ball, or bike riding down our streets. Jamie is the youngest of six. He was fortunate to have two wonderful parents, who have been married over fifty years. They taught Jamie the value of family, integrity, and education, which are the same values his wife and him share with their children. Jamie is employed as a Juvenile Probation Officer. He loves his job because it gives him the chance to help shape the lives of some of our youth in the Cook County area. Since 2008, Jamie has been honored to serve as a Trustee for the Village of Melrose Park. Jamie believes the trustee position enables him to have a positive impact in making Melrose Park a great place to live and raise a family. Over the years, his professional career and his eagerness to give back have led him to volunteer for various not-for-profit organizations. 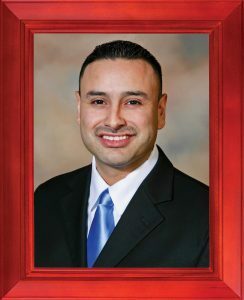 He has served as a Board Member and Vice President of School District 89. Jamie is a current member and previous Vice President of L.A.P.I.S. (Latin American Professionals Impacting Society) and of the Cook County Latino Employee Association, which focuses on equal rights employment. He is also active in the Toastmasters International Speech Organization. The focus of this organization is to help a person become an efficient leader. Jaime Anguiano’s most gratifying volunteer work is the time he spends mentoring young men and women at Lincoln’s Challenge Boot Camp.